Being able to answer these questions will prepare you for your interview process by not only having outstanding answers, but also give you a boost of confidence when engaging in the overall process. 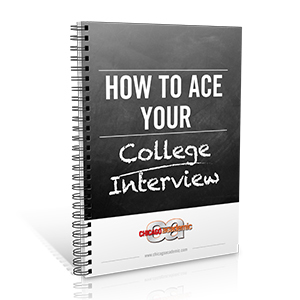 To learn how to successfully answer these questions and ace your college interview, read our NEW white paper "How to Ace your College Interview" by clicking the photo below! If you want to learn more about preparing for the college interview or the college application process contact Chicago Academic to learn how we can help you!